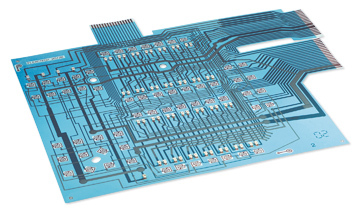 Douglas Corporation has over 30 years experience meeting the exacting demands for high quality membrane switches and graphic overlays from the world’s leaders in the appliance, electronic, automotive and other industries. Today’s environment of “Zero Defects”, ISO, SPC, JIT delivery and other management concepts, all geared toward premium membrane switches and graphic overlays, demands quality. That’s why Douglas has developed company-wide practices which assure uncompromised production excellence on every program we’re awarded. That means you can expect our total commitment to every facet of our business…from initial quotation to on-time delivery of quality parts that exceed your expectations. We live and breathe precision. Whether your switch project involves a multi-tasking circuit design, assembly and surface mounted components or precise print registration — our skilled employees put their knowledge to work everyday in an environment of total quality control at each stage of the process.